Curious? Just "Ask a Scientist"
In the run of a day your senses relay data to your brain, your body’s organs run like a programmed machine. Your emails can be sent from Halifax then arrive in Tokyo seconds later. You might enjoy a long weekend unplugged, head out to Cape Chignecto Provincial Park for a hike and find yourself wondering why the Bay of Fundy has the highest tides in the world. You are a scientific phenomenon. The things you notice when you’re awake or remember from when you were sleeping are scientific phenomena too. Some people have dedicated their lives to noticing, observing, investigating and analyzing scientific phenomena. Others have decided to help scientists share that work with the public. In honour of Dalhousie’s Bicentennial, the Faculty of Science will celebrate both types of science champions. Beginning this month, Dal Science professors, staff, students, and alumni will hit the streets to share their passion for science in the community. 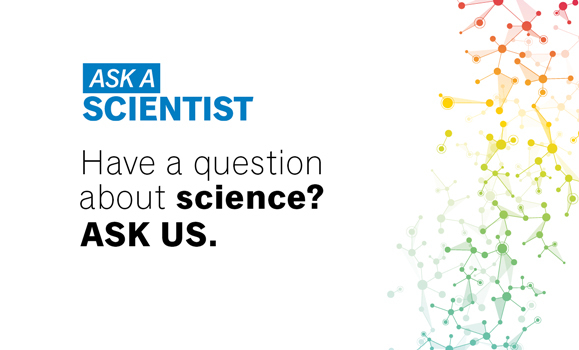 Ask a Scientist is a summer-long science outreach project designed to bring people together through their shared curiosity about scientific phenomena. Ask a Scientist will make appearances in three Halifax locations this June, the first of which is later today (June 6) at Discovery Centre. Between 5-8pm every Wednesday, Discovery Centre waives admission fees so visitors can enjoy the science centre for free. On World Ocean Day (June 8) later this week, Discovery Centre will open its long-awaited Ocean Gallery. Those who show up for up for the free programming this evening will get a sneak peek of the interactive activities featured in that exhibit. Plus, post-doctoral fellow Kimberley Davies and master’s student Delphine Durette Morin will be on-hand to help field questions about the ocean. Visitors wanting more specific information can ask the scientist and scientist-in-training about their critical work on the endangered North Atlantic right whales, a species that made headlines last summer because of an alarmingly high number of dead and injured whales found in the Gulf of St. Lawrence last summer. For the next three months, economists, geologists, chemists, ecologists, microbiologists and more will be sighted in popular summer locations around the province. To help run this special 200th anniversary project, the Faculty of Science brought outgoing president of the Dalhousie Science Society and third year Neuroscience student Shauna Bulman on board for the summer. Besides coordinating each Ask a Scientist appearance, Shauna will co-host a new CKDU show and podcast with assistant professor David Barclay of the Department of Oceanography. Called Sciographies, each episode will feature a Dalhousie scientist and explore the events in their lives that led them to a scientific career. Guests on the show will also speak to their research expertise and provide commentary on topics like the neuroscience of cannabis. Dr. Barclay’s research is focused on underwater acoustics, naturally, and he enjoyed a long career in campus radio before coming to Dalhousie a few years ago. Shauna’s segment, on the other hand, will delve into the science so she can fine-tune her interviewing skills—a must for anyone thinking about a career in science communication. “We’re really excited about Ask a Scientist and Sciographies,” says Dr. Moore. “We’ve never done anything like it before.